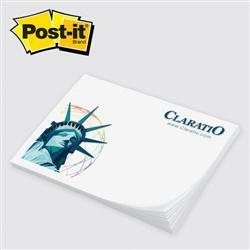 Post-it® Custom Printed Notes Value Priced Program 3" x 4"
The low cost option — same great Post-it® Brand promise, service and delivery with restrictions on print capability. Do you need help with artwork or trying to visualize your logo on this product? Email sales@adcomarketing.com and we can get it started for you! 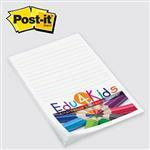 Available Colors: White Paper Only on Value Priced Program. Dimensions: Actual Size: 2-15/16" x 4". Typical Imprint Area(s): Imprint Area: 2-9/16" x 3-5/8"; Adhesive Side: 4" edge. Available Imprint Options: FULL COLOR IMPRINT - Up to 4 colors for 4 color process. Actual Size: 2-15/16" x 4" white sheet, 25 sheet thickness. 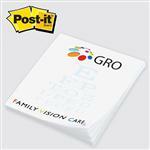 Post-It Note Brand. Made in USA. Recyclable. Full Color Imprint Included. 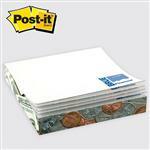 Post-it Custom Printed Notes Slim-Cube - 3/4" x 2-3/4" x 1/2"